There are a lot of iPhone stands in the world. Some are functional, others are plain silly. This iWrench belongs to the latter. The problem seems to be not the whole concept behind using a wrench to prop up an iPhone. The problem is the size of this wrench keeps it from being useful as a wrench. Why would you need to have an iPhone stand when you can’t fix the plumbing? Anyone who has ever held a monkey wrench, an honest to goodness monkey wrench, knows that what they possess is a powerful tool upon which entire civilizations are built. We’re not kidding when we claim that one out of every five households in the world have a busted sink. Where did we get that statistic? Nowhere. Just made it up. 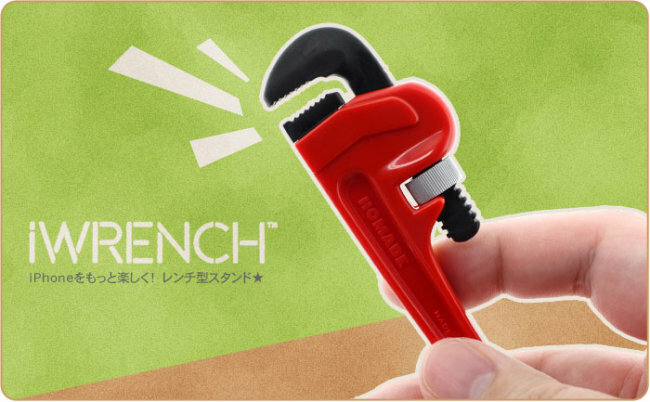 Oh right, this is about a toy wrench that also doubles as an iPhone stand. Yeah, it looks nice. Would make a great key chain too. You hinge it on the side of your iPhone (or any phone) and prop it up, easy peasy. The iWrench is already available for orders. According to one retailer it goes for $9. That’s fair.